'Bewildered Blue Butterfly' (Caroline Chacon, R. 2010) Seedling BSb-1. AB(OGB-), height 16"-17" (41-43 cm. ), Early to mid bloom season. 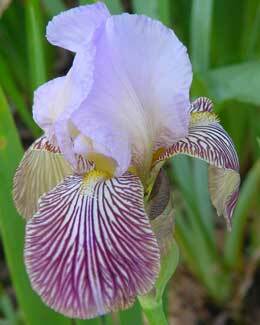 Standards and style arms lavender ice; falls same, center blaze circled with strong maroon veining, slight light rim; beards yellow. 'Butterfly Wings' X unknown.